Delicious comfort food, a wide selection of whiskey and cocktails --- Crimson was made for trivia players! Located right on H street, it's in a great location near the metro. 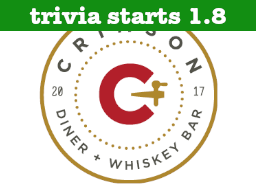 The inaugural District Trivia night at Crimson is Tuesday (1.8) and the game begins at 7pm. Don't miss out on the first step toward winning $5000 cash!